Winner 123 ammo eka ganna epa bro.yanna puluwan.bt man eka kiwwe joke ekata.trade karanna one nam wena ewa tiyenne.boruwata oke nam hira wenna epa. Yes ,still we have to do more studies before buying ANILANA. But still good opportunities,in the market with some good shares. Now what will happen to people who bought ACAP @ 11 yesterday. Now the price drop is 10% from that. @reader wrote: Did some day trading after long time.. It's to u . Donkeys and knowledgeable people also buying now . Donkeys with in few days exit and knowledge investment within few weeks counting they are profit. 2nd consecutive day of day trading .. brought @ 9.60 and sold @ 11.10. I ll buy again. if come down to 9.50. But if you don t hv holding power. Better to away from this share at the movement. There are enough risk free counters. @Winner123 wrote: NO I GUESS KARUNA YOUR THOUGHTS PLS. Today technical drop and day trading people exit and next acap bring technical support with asi numbers . still i am in collection. I need big quantity from this stock. I hope to keep 2 quarters after that sale this stock. ACAP is not bad at these levels. Private placement done around 18/- I believe. This group has amazing mega projects. Passing 12 levels is possible. Profit takers may exit early. @Teller wrote: ACAP is not bad at these levels. Private placement done around 18/- I believe. This group has amazing mega projects. Passing 12 levels is possible. Profit takers may exit early. stockback, are you still holding your SFL or disposed or averaging down? Why are you so exited about invest in ACAP and keep for six months? Why don't you think that stocks like LITE, CWM, KCAB, CIND, PARQ, SFIN, etc should bought and hold for six months? SFL.N throw with loss. I will enter again if its fall below 10.
and final thing is Target. 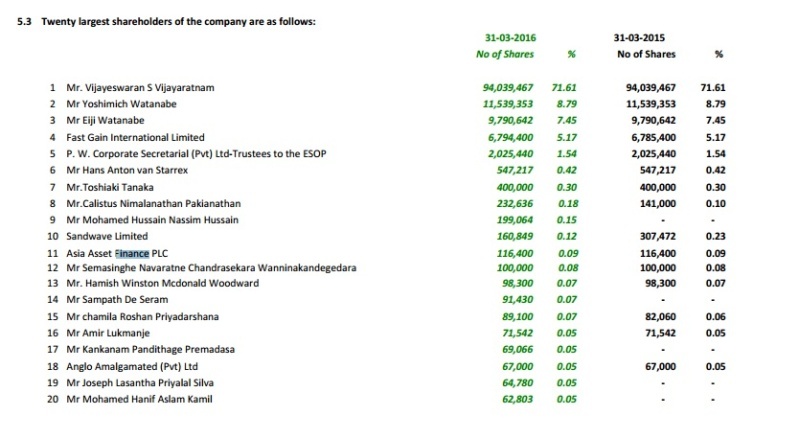 these stock we cannot target big amount ( CWM, KCAB, CIND, PARQ, SFIN) from this point. but i Like for LITE in future I will enter this stock. IF ASI drop Heavily then I will enter to LITE. I will wait until that. but SFL has third class cheap promoter. thats why that stock got stuck. I ask him to stop promoting and give its own time for SFL to build the trend. Then you should have TAFL,GRAN,COCR, BLI,etc. @EquityChamp wrote: Then you should have TAFL,GRAN,COCR, BLI,etc. Ec cwm is good company but very illiquid...u can't collect even 10k. @Mubin Mustafa wrote: Ec cwm is good company but very illiquid...u can't collect even 10k. Passing 12 is not a dream. As expected ACAP didn't drop to bottom. Some people are still afraid due to lack of knowledge about ACAp. ACaP main holders over 90% but they may not sell at all in these levels. Another 24-29 million is enough to set ACAp price to 15/- levels. We can expect this scenario based on current performances. A well planned investor can enter with fresh capital to collect below 15/- will be a great winner. this is good stock now. CAN YOU GIVE A SOURCE ? I bought few and the seller was ASI. There is a nice story too. I love to here fairy tails. You know what is a fairy tail? @EquityChamp wrote: I bought few and the seller was ASI. There is a nice story too. I love to here fairy tails. You know what is a fairy tail? @stockback, think what you are saying is not relevant to what I said here. Can you check again and comment before turning this into an ugly conversation. I am playing my own game. profit target is 100% or more within two quarters. Have I told anything wrong to you for you to get upset. I wrote a fact here. Can you scroll back and see what I written there. I repeat I bought few of this stock and the seller was ASI. So what is in it for you to get upset unless otherwise you are a client of ASI and sold out. i am not afraid to short term price movement. if stock has fundamental value. go through this. what you say and what inside of it. Technical potha hatiyata loku trading quantity eakak samaga udaama share eaka ahasata wisi karanda puluwan .